The freshly released RBA meeting minutes just renewed my bearish forex bias on the Aussie so I’m looking for other ways to short this currency. After all, the transcript showed that central bank officials agreed to keep policy accommodative while emphasizing that further AUD depreciation would be both likely and necessary. I’m looking at this neat uptrend forming on EUR/AUD’s 4-hour forex chart, as the pair seems to be forming an ascending trend line and gearing up to test support around the 1.4300 major psychological mark. This coincides with a former resistance area and is somewhere between the 50% and 61.8% Fibonacci retracement levels. Price seems to be finding support at the 38.2% Fib for now while stochastic is starting to move up from the oversold area, which makes it a little tempting to jump in at market. However, I’d like to be a little more patient with this one since I’m still waiting to hear how the next set of Greek debt talks this week turn out. I’m thinking we might be in for much more drama but that an eleventh hour deal might be reached before the end of June. Long EUR/AUD around 1.4300, stop loss below the trend line at 1.4100, profit target around the previous highs at 1.4700 for a 2:1 reward-to-risk ratio. 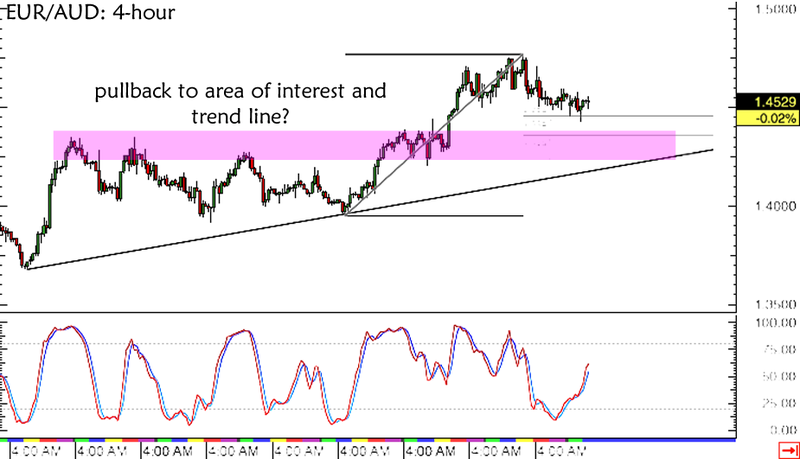 Make sure you check out our risk disclosure if you’re thinking of taking this setup, too! What do you think of my trade idea?